Lane Bryant is a store that specializes in plus size clothing. I was at their outlet store recently, and I had no clue they had nail polish. Not only did they have polish, but great colors too. They were $6 each a bit pricey, but it was BOGO 1/2 off. The bottles and colors reminded me of Claire's colors. They weren't dupes of Claire's colors I don't think, but they had a similar array of unique shimmers,glitters,cremes, and flakies! 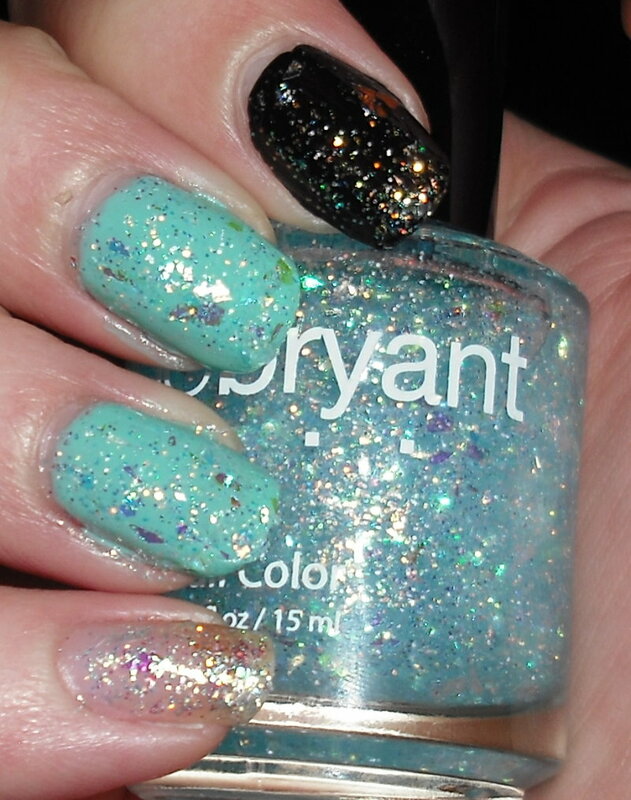 Island Volcano is sheer icy blue packed with iridescent glitter and flakies. This polishes is not shy it is loaded with bling. I love the icy look of this polish. I think this would look great for the holidays and during winter. It has a very "Jack Frost" look to it. I love it layered over Essie Turquoise & Caicos. I'm very impressed with this polish. It is truly unique! That's a gorgeous glitter! I didn't know Lane Bryant had nail polish either. This is so pretty, it looks amazing over Turquoise & Caicos. The pairing with the turquoise is perfect. I like the Jack Frost reference. Come on Winter! i agree it looks great over turquoise.. kinda wintery too! Even on its own it's so so pretty! I had no idea that LB did polish. That glitter is really pretty. I'm loving this it's so wintery. rmcandle- I'm so glad they do have polish! Steffie- Thanks! Yeah, I don't think the black did it justice either. I should of layered it over white..
Ice Queen- Thanks! I love festive backgrounds. I have a more festive one coming up closer to Thanksgiving. Kimberly- Yes, I found these at Prime Outlet.